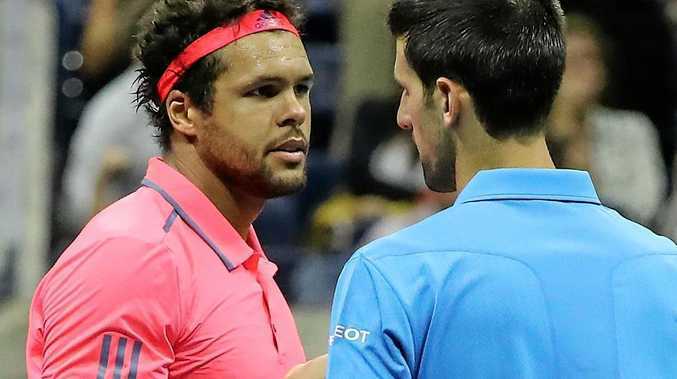 TENNIS: Novak Djokovic has wished vanquished opponent Jo-Wilfried Tsonga a speedy recovery after the Frenchman became the third player to take on the Serb at this year's US Open to be hit by injury. The defending champion, looking for his 13th grand slam title, has had an armchair ride to the semi-finals. He opened his defence with a hard-fought win over Poland's Jerzy Janowicz before getting a walkover against Jiri Vesely. Russian Mikhail Youzhny quit after just six games and 31 minutes on court before Djokovic eased past Britain's Kyle Edmunds in straight sets in the round of 16. In the last eight, Djokovic took the opening two sets 6-3 6-2 before Tsonga was hit by a knee problem and could not continue. "I really wish Jo a quick recovery,” Djokovic said. "It's never nice to be on the court in the quarter-final of a slam and retire. Another Frenchman, Gael Monfils, will be Djokovic's opponent in the last four after he beat countryman Lucas Pouille 6-4 6-3 6-3. There were also injury problems in the women's quarter-finals with Caroline Wozniacki defeating Anastasija Sevastova 6-0 6-2 after the Latvian rolled an ankle early in the first set. She will face Australian Open winner Angelique Kerber in the last four after the German defeated last year's runner-up, Italy's Roberta Vinci, 7-5 6-0.